Vegetable Pasta made with cheese tortellini – quick easy and delicious! 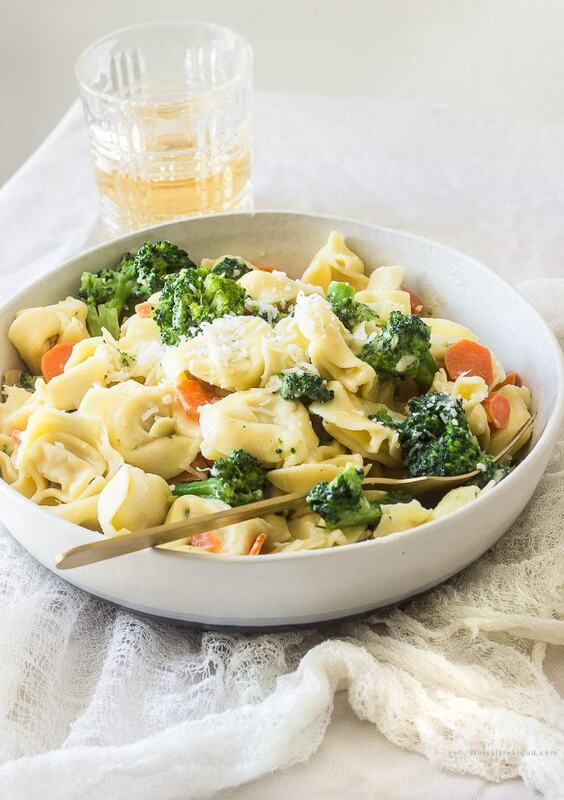 Adding a buttery garlic Parmesan cheese sauce to your tortellini vegetable pasta is a great and way to incorporate more veggies into your diet. This creamy cheese sauce vegetable pasta is a 20 minute super easy recipe! Tortellini comes from Italy. They are small rounds of pasta that are stuffed with either cheese or meat. I’ve even seen some stuffed with mushrooms. The are then rolled into small rings that resemble a navel. That’s right. Tortellini looks just like someones belly button. I love to use Tortellini to make this vegetable pasta. More on that below! Tortellini please! I adore tortellini. I also love meaty pastas but I also love veggie only pastas. I’ve been making this vegetable pasta & garlic butter Parmesan tortellini for years. I remember the first time I made tortellini pasta with vegetables. That was way back in the day (years ago) when I didn’t cook a lot, but I still knew how to whip up easy dinners. Back then, I first experimented with my favorite vegetable, broccoli. Once I started making it more often I would experiment with other vegetables like cauliflower and carrots, or asparagus with mushrooms, or peas. Sometimes I would also add chicken to the veggie pasta. Everyone used to go crazy over my vegetable pasta. If you’re the type that love meaty pastas (like my husband) feel free to add chicken. I normally make chicken breast for the Mr. because he NEEDS meat with all his dinner and lunch meals. If I make him meatless pasta, he’ll look at me in confusion then ask that question. Can you guess his question? If you guessed, “where is the meat” then you’re right. This vegetable pasta & garlic butter Parmesan is so delicious! You’ll think you’re dining at a 5 star restaurant. If you love this pasta, you’ll probably love this one and this amazing Chilis copycat spicy Cajun Parmesan pasta. What kind of vegetables to add to pasta? Some good choices besides carrots and broccoli are mushrooms with spinach (mushrooms and asparagus is delicious too). Snap peas and zucchini are perfect in vegetable pasta too. The add ins are all up to you. When I want to make vegetable pasta I always use whatever I have in the fridge and cabinets. If I’m out of tortellini, then I’ll use rigatoni, elbows, ziti, etc. So to make this vegetable pasta yours, use whatever pasta or vegetable you have available. How to make vegetable pasta? 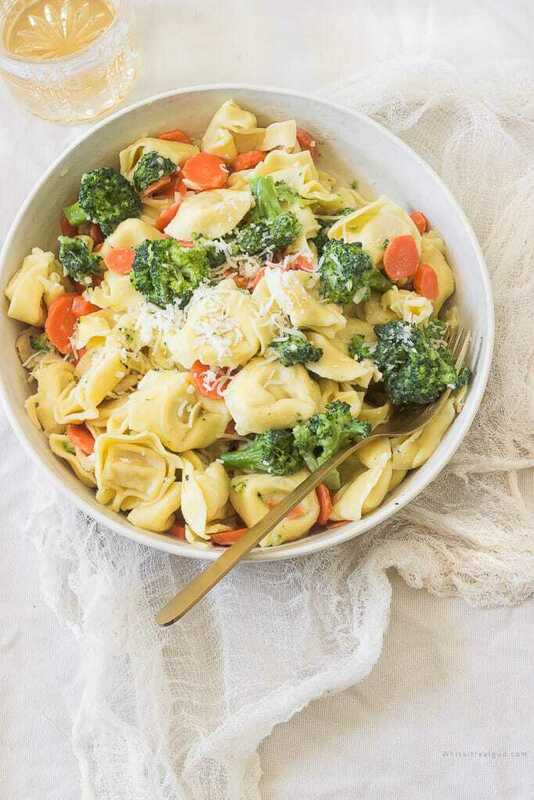 This vegetable pasta & garlic butter Parmesan cheese tortellini pasta is super easy to make. The cooking time depends on the type of tortellini you have. Make sure you cook the tortellini according to the package instructions. Since there isn’t any meat in this recipe, you’ll have dinner on the table in no time. Delicious and fast. Less than 20 minutes! Prepare the tortellini per the instructions but substitute chicken broth for the water. 2-3 minute before the pasta is cooked, add in the broccoli and sliced carrots. Add the tortellini back into the pot. FYI, to make this recipe vegetarian, substitute vegetable broth for the chicken broth. I always reach for Better than Bouillon chicken base or their vegetable base. It’s so much more flavorful than boxed broth. If you happen to use Better than Bouillon be mindful of the amount of salt you use. There is already salt in the BTB. The cheese sauce is simple to make: To a large saucepan melt the butter over medium heat. Add the red pepper flakes and minced garlic and parsley. Stir frequently until fragrant (about a minute). Gradually whisk in the heavy whipping cream and cornstarch whisking constantly until thickened. Fyi, Add the tortellini with veggies to the saucepan and toss. Stir in Parmesan cheese and gently stir. Season with salt and pepper. Serve the vegetable pasta immediately with additional Parmesan cheese. 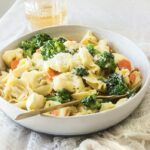 Vegetable Pasta & Garlic Butter Parmesan (Cheese Tortellini) - quick easy and delicious! Adding a buttery garlic Parmesan sauce to your tortellini vegetable pasta is a great and way to incorporate more vegetables into your diet. Prepare the tortellini per the package instructions but substitute chicken broth for the water. 2-3 minutes before the tortellini is done, add the broccoli and sliced carrots. Drain well. Add the tortellini back into the pot. To a large saucepan melt the butter over medium heat. Add the red pepper flakes and minced garlic and parsley. Stir frequently until fragrant (about a minute). Gradually whisk in the heavy whipping cream and flour whisking constantly until thickened. Add the tortellini with veggies to the saucepan and toss. Stir in Parmesan cheese and gently stir. Season with salt and pepper. Serve immediately with additional Parmesan. For a vegetarian option substitute vegetable broth for the chicken broth. I always reach for Better than Bouillon chicken base or their vegetable base. It's so much more flavorful than bland boxed broth. If you happen to use Better than Bouillon be mindful of the amount of salt you use since there is salt in the BTB broth. Hi April! I plan on making this tomorrow. I don’t like carrots so I’m going to use your suggestion and substitute mushrooms for the carrots. 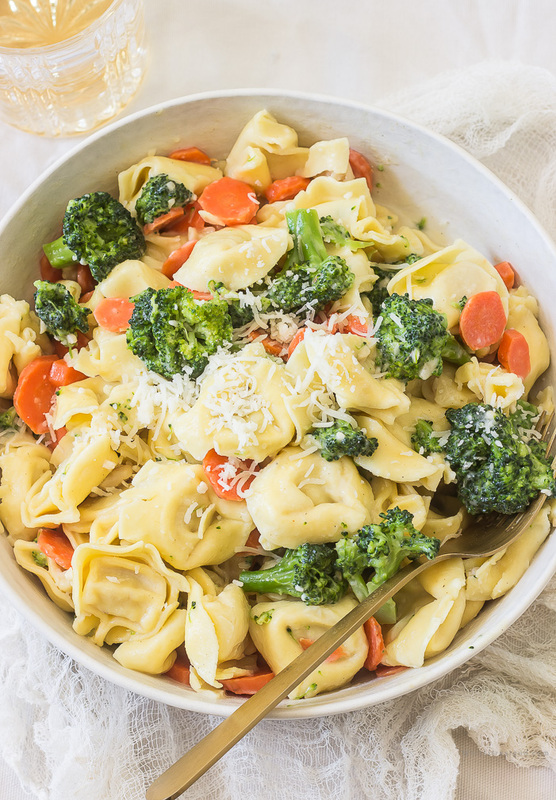 Broccoli and mushroom cheese tortellini sounds fantastic. Thanks for the easy recipe! It looks delicious! Thank you Nancy! I hope you like it as much as I do! I love the way the broccoli looks in these photos, you can literally see how it soaks up that lovely butter, cream and Parm sauce. So yum! I love how colorful this pasta is! Looks absolutely delicious and healthy- perfect as an everyday quick dinner!